The Valuer General sends landholders a Notice of Valuation showing their land value when their council receives new values for rating. The Notice of Valuation gives landholders the opportunity to consider their land value before their council uses it for rating. 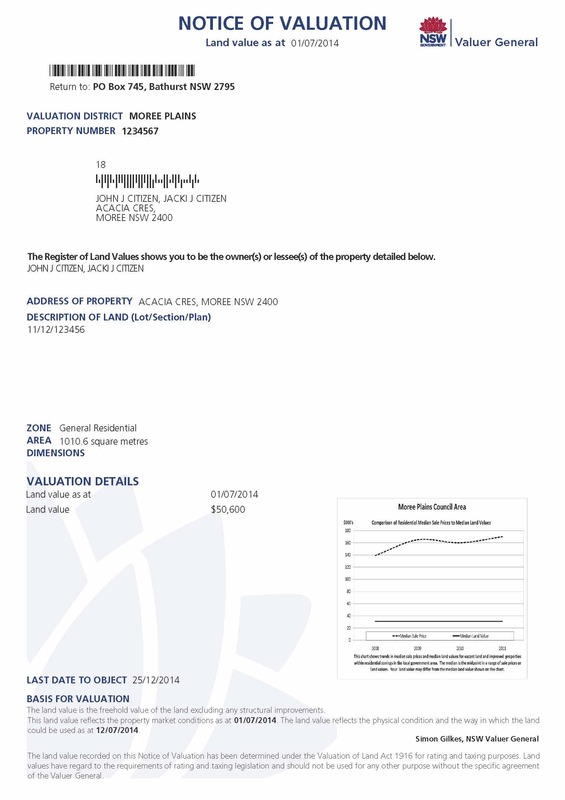 You can find more information about the Notice of Valuation on our fact sheet. Notices of Valuation are issued at least every three years. make separate new valuations for land that was previously valued together. You can find more information on supplementary Notices of Valuation on our fact sheet. Concerned about the land value or property information on your Notice of Valuation? If you think the land value or property information on your Notice of Valuation is wrong you have 60 days to lodge an objection with the Valuer General to have it reviewed. You can find more information on lodging an objection here.